Yoshinori Sato held back NPB’s top offense for as long as he could. It turned out to be just long enough for one of Japan’s top offensive players to put the game away. Sato held the Hiroshima Carp scoreless for six innings and Tetsuto Yamada hit a three-run homer in the bottom of the sixth to help the Tokyo Yakult Swallows earn a 5-2 win on Thursday night at Jingu Stadium. “I wasn’t at my best, but I knew if I could keep them from scoring that I would have a chance to win,” Sato said. Sato was making his third start of the season after missing the past four years, and most of this one, because of injuries. He won his second straight decision and the victory was his first at home since Sept. 3, 2011, against the Yomiuri Giants. “Thanks for waiting,” he said. Sato (2-1) held down a Carp team that began the day leading NPB in runs scored (497) team average (.272) and home runs (104) and had opened the current series by torching Yakult for 16 runs on Tuesday night. He allowed just three hits and struck out seven, but also walked seven. The walks put him in tight spots as he waded into and out of trouble for most of the night, always managing to wriggle free unscathed. He said he mostly focused on following the lead of his catcher, Akihisa Nishida. “I’m just really happy Yoshinori was able to be the winning pitcher tonight,” Nishida said. Nishida also did his part at the plate, hitting a triple in the second inning that led to the game’s first run. He also finished with a single and drew a walk. Naomichi Nishiura gave Sato the lead with a sacrifice fly that allowed Nishida to score in the second. He furthered his pitcher’s cause with an RBI single in the fifth. Yamada put more distance between the teams with his three-run shot in the sixth off reliever Kazuki Yabuta that made the score 5-0. “He threw me an outside fastball and I was just able to put a really good swing on it,” Yamada said. Yamada, the Central League leader in RBIs (79), stolen bases (26) and walks (77), hit his second home run in as many days, giving him 32 on the season. Only the Yokohama BayStars’ Yoshitomo Tsutsugo, who leads NPB with 33, has more. Carp starter Yuya Fukui (2-3) gave his team five innings on the mound, allowing a pair of runs on four hits. He struck out five and walked seven in the losing effort. Hector Luna got the Carp on the board with an RBI single in the seventh and Ryosuke Kikuchi hit a solo homer to begin the top of the ninth. The Carp, who have lost five of their last eight, saw their lead in the CL shrink to 6 1/2 games. They’ll head home with a series against the second-place Yomiuri Giants, who have won five straight and were idle Thursday, set to begin Friday. Yokohama BayStars closer Yasuaki Yamasaki gave up two runs in the ninth to force extra innings before reliever Mike Zagurski (3-1) gave up a double and three walks in the 10th inning in the Hanshin Tigers’ 7-5 victory on Thursday in the Central League. At Sendai’s Kobo Stadium, Chihiro Kaneko threw seven shutout innings and picked up his fifth win as Orix blanked Tohoku Rakuten. 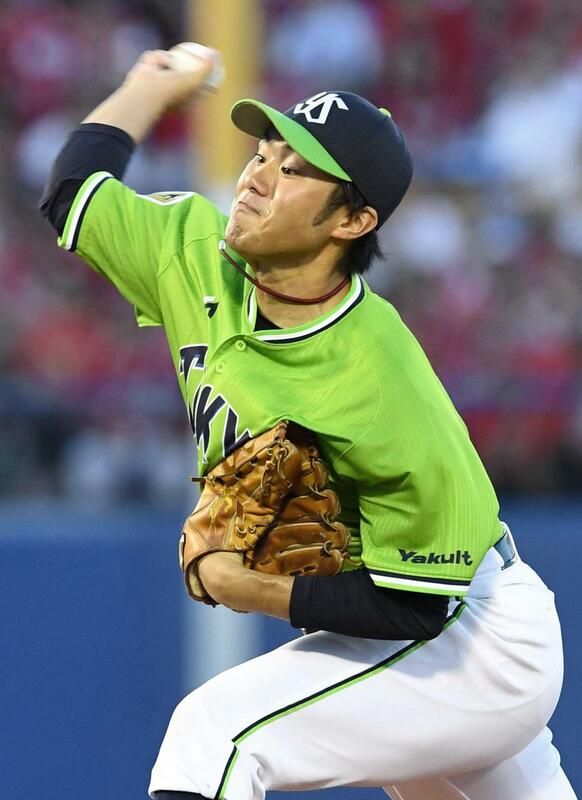 Kaneko (5-6), the 2014 PL MVP, allowed three hits without a walk, while whiffing eight to outpitchTomohiro Anraku (0-3). The rookie right-hander allowed two solo shots to take the loss despite holding the Buffaloes to four hits over eight innings. Anraku, 19, struck out two in the first inning, but gave up a homer in the second to Takahiro Okada, who blasted the first pitch of the frame over the right-field pole. Kaneko benefited from some slick fielding in the third, with shortstop Ryoichi Adachi and second baseman Masahiro Nishino fielding tricky grounders for the first two outs. Anraku, who fanned five and hit a batter, was burned again in the eighth by a leadoff homer on a first-pitch fastball as Brent Morel pulled one over the left-field fence. The Eagles had a chance in the ninth with a leadoff walk off Orix closer Yoshihisa Hirano and an infield error, but Takumi Miyoshi struck out trying to bunt and two groundouts ended the game. At Tokorozawa’s Seibu Prince Dome, Shinya Tsuruoka went 4-for-5 with a double and three RBIs as league-leading SoftBank completed a three-game sweep of Seibu. At Chiba’s QVC Marine Field, former closer Hirotoshi Masui made his first start since September 2010, but Hokkaido Nippon Ham’s bullpen wasted his five scoreless innings as Chiba Lotte’s Alfredo Despaigne and Daichi Suzuki hit sixth-inning RBI doubles. 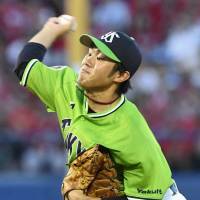 Marines starter Yuki Karakawa (4-4) scattered six hits and three walks over seven innings to earn the win.